It's been confirmed that the 82 year-old Tommy Yannima Watson has died in Alice Springs. The old man produced scores of glorious paintings reflecting an extraordinary ability to abstract his deep understanding of Pitjanjatjara law and legend, but was cruelly abused by many in the industry for the choices he made in his relationships with white art dealers. The consequence of that abuse is that many of the artist's greatest works painted after 2005 – which, in 2007, made him the highest-paid living Aboriginal artist - are not seen in our institutions because of a black-balling of the works by curators and art centre coordinators. Watson's early life was typical of desert men – minimal contact with white society until the missionaries, then the pastoralists at Mt Ebenezer Station brought him in to labour for rations. He also experienced the confusions of Papunya – officially assimilation, but in fact housing a rebellion against that policy through art; though Watson, as a Pitjanjatjara man, was then unwilling to reveal the inner meanings of his culture. It was only in 'retirement' in Irrunytju – or Wingellina, a tiny township just over the WA border – that he accepted the encouragement to paint. And when the community offered works at auction in Sydney in order to raise funds for the art centre, his was the stand-out painting, in both quality and price. Sadly, this primacy put him under pressure, and Watson with a niece, Jorna Newbury, left for Alice Springs, where it was all-too-easy for the artist who spoke virtually no English to be persuaded to paint for a local gallery for minimal return. A document sighted in court later revealed that the gallery thought 10% of the resale price (less costs) was a fair return for this already recognised master. This lead to a court case in which I was involved. Tommy Watson was now working with a private Melbourne dealer called John Ioannou – who took his role seriously enough to learn Pitjanjatjara and became an initiated man. In court, Watson's patent failure to understand that he might have been exploited lead to a case brought against the Alice Springs gallery and the return of paintings worth several hundred thousand dollars to the artist. But Tommy's allegiance to Ioannou and his Agathon Galleries in Sydney and Melbourne lead to a total rift with the art centre community, especially when Ioannou was invited to come in to run the Irrunytju Art Centre. 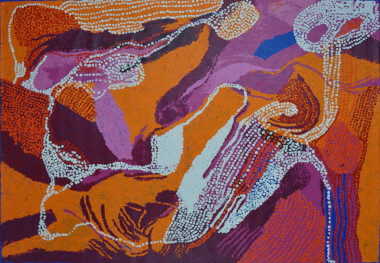 This included a threatened boycott of the important Telstra NATSIA Awards by other desert art centres if any Ioannou-associated artist was accepted. The art institutions of the south joined this boycott. And, though Watson was officially selected as one of eight Indigenous artists to decorate an administrative building at the Musee du quai Branly in Paris, he was not invited to attend the opening by curators Hetti Perkins and Brenda Croft. But Tommy Watson kept on painting. A book was dedicated to his work, an Art Hotel in Adelaide is teeming with his canvases, and as his opus built and built, one might have got the impression that everything was red – with just the occasional surprising patch of oppositional colour...a ring of white, splashes of blue, a sand-blasted curve of yellow or green. As SMH critic John McDonald commented in the book, Watson had the surprising ability to mix “warm and cool shades of red...instinctively”. Interpretation came from John Ioannou. “Red is essentially the colour of the initiated man in the Desert. From the red head-band Tommy wears through all his paintings, red is a recognition of the blood spilt and ceremonies he's undertaken, and the authority that comes from them”. 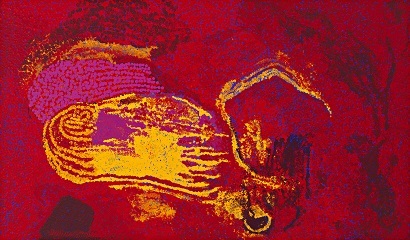 The book then reveals an almost infinite variety of dotted patterns on red backgrounds – rhythmic and textured, sung as they were painted – spread across countless canvases that also succeed in imprinting the old man's knowledge of a deep diversity of Pitjanjatjara stories that go back to the flooding of his tribe's southern spinifex country when the ice last melted 10,000 years ago. Each painting may have a title – but its meaning was never explained. Watson had much in common with the old men of Amata who stopped painting sacred subjects when too many questions were asked. The book also benefits from the words of Marie Geissler, its co-author who observes his “increasing freedom of line, his developing overlay, his sensitivity in the use of paint and his boldness of execution. I'd say he's been going places no other Indigenous artist has gone, and one can genuinely make comparisons with the profound inner sense of self that emerged in Abstract Expressionist work by Kandinsky, Gorki and Rothko – heavily influenced as it had been by tribal art and primitive art from Eastern Europe”. In 2013, there was another hiatus in Tommy Watson's life – for the relationship with Ioannou was sundered by Jorna Newbury wanting to look after the old man in Alice Springs. At which point he fell in with the legendary Chris Simon's Yanda Art – another dealer outside the community art centre network. Significant works have continued to emerge at a remarkable speed from the house in Alice which Tommy was able to buy with this late-life flow of funds. Tommy Yannima Watson died in that house at the end of November. His painting probably peaked in 2013/4, and towards the end, he declared that he'd painted all his stories. It seems possible that his old nomadic instincts not to stick around as a burden to the tribe kicked in. And now that he has passed, surely it would be only proper for a major national institution to hold a respectful retrospective.